Rosalie Tocco-Bradley, PhD, MD has been appointed chief medical officer for St. Joseph Mercy Ann Arbor (SJMAA) and St. Joseph Mercy Livingston (SJML) hospitals, effective Dec. 1. In this role, she will oversee administration for medical staff, graduate medical education, patient safety, clinical quality, accreditation, care management and other services. “I am so pleased to have this opportunity to enhance the quality of health care delivery on a much broader scale with all providers and patients in our organization,” said Dr. Tocco-Bradley. An anesthesiologist by training, Dr. Tocco-Bradley has worked as a clinical anesthesiologist at SJMAA and SJML hospitals since 2003. She will transition from her current position as chair and medical director of the Department of Anesthesiology and Pain Medicine at both SJMAA and SJML, which she has held with distinction since 2004. 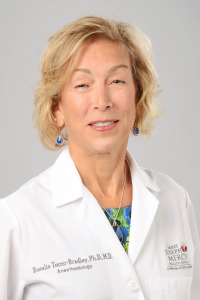 During her tenure from 2010 to 2012 as chief of staff of St. Joseph Mercy Ann Arbor, Livingston and Saline hospitals, Dr. Tocco-Bradley spearheaded the transition of three separate medical staffs into one with unified departments, credentialing, bylaws and policies. Dr. Tocco-Bradley earned her medical degree at Harvard Medical School and her PhD in human physiology from the University of Michigan.